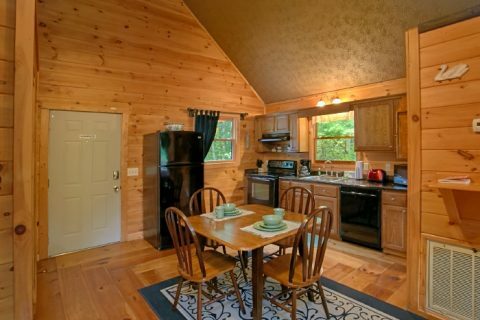 Become enchanted by "Passion Pointe," a lovely log honeymoon cabin rental in the Smoky Mountains. 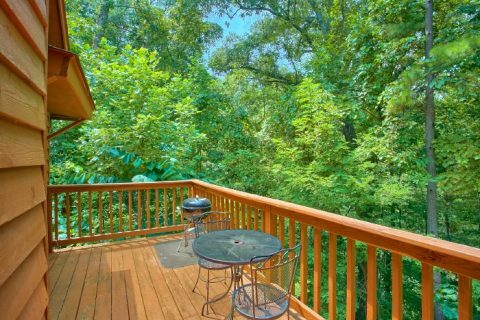 Nestled in a peaceful, forested setting only a short drive from Pigeon Forge, this cabin has everything couples need for creating romantic memories in the Smokies. 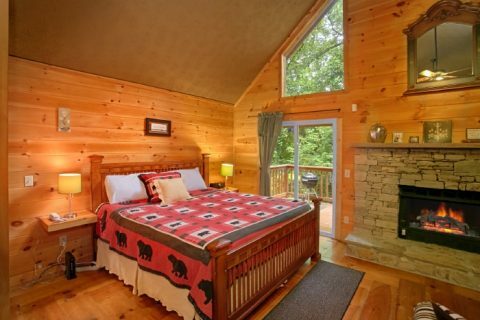 This 1 bedroom log cabin comfortably sleeps 2 guests and boasts romantic amenities like a hot tub, fireplace, and heart-shaped jacuzzi tub. 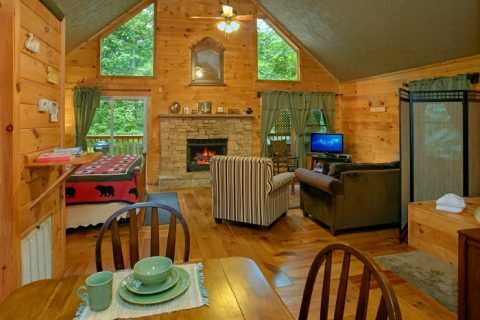 When you aren't playing at attractions on the parkway, enjoying theater shows, or hiking in the Smoky Mountains, you can enjoy rest and relaxation at your comfortable log cabin in the mountains. The main bedroom features a king-size bed and a full bath for relaxing in the evening. For couples celebrating anniversaries or marking their marriage with a honeymoon vacation, there are plenty of ways to enjoy your partner's company in the Smokies. 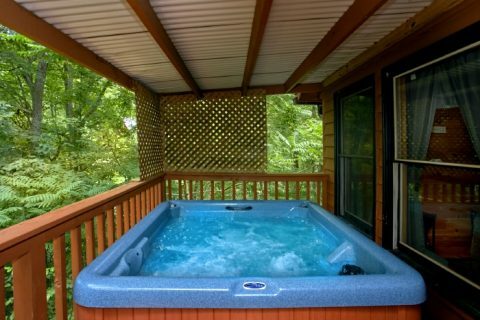 Relax in your outdoor hot tub nestled among the trees. 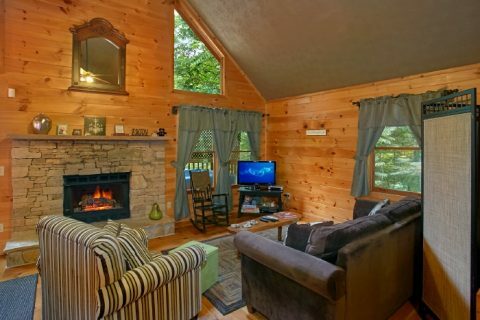 Enjoy your favorite movie on your cabin's television near the warm, wood burning fireplace. 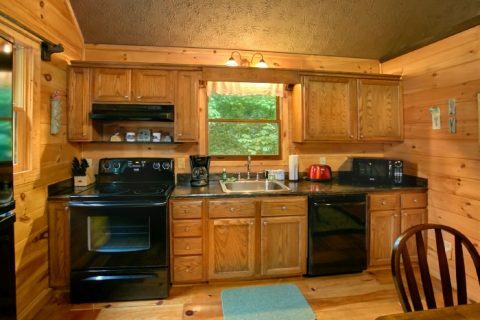 Eat a delicious dinner for two prepared in your cabin's fully equipped kitchen. A charcoal grill provides you the option to grill some delicious steaks for a real dinner treat. 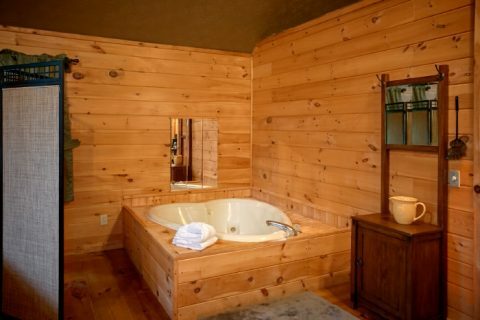 After dinner, take a soothing bath in your cabin's heart-shaped jacuzzi. WiFi Internet streams throughout your cabin, so it's easy to find the proper music to suit the mood. Set out for "Passion Point" and a romantic vacation in the Smoky Mountains that will create cherished memories for you and your special someone. 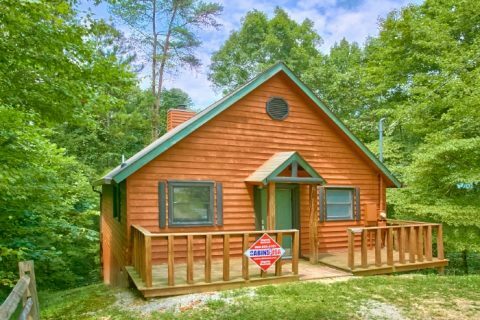 Better yet, book your Smoky Mountain honeymoon cabin with Cabins USA Gatlinburg and save 15% on your lodging with our discount!